There's not enough private enterprise in Canadian soccer to allow it to be successful. [Pt 1/4]. Because this is a World Cup year, I have decided to countdown to the tournament by providing a short soccer/fitness related preview of each of the 32 participating nations. In this installment, I will look at England, World Cup champions in 1966 and the country that is credited for developing rules of the game and spreading it around much of the world 120 years ago. The English have drawn a tough group that includes Italy, Uruguay, and Costa Rica, and they play their first match against Italy on June 14th. Several other prominent coaches and players interviewed for The Italian Job echoed the sentiments expressed by Colbert, however, the book was published almost 8 years ago. With recent advances in coach education and training in England, the addition of some foreign coaches, as well as domestic and foreign sports scientists and fitness coaches, things are changing in the country. Players are developing physically, technically, and tactically, closer to the standards set by their European and South American counterparts, and the result could be more success for the English National team. Could England perform above expectations this year, and reach their first World Cup final since 1966? We will have to wait and see what happens in 2 months’ time. Because this is a World Cup year, I have decided to countdown to the tournament by providing a short soccer/fitness related preview of each of the 32 participating nations. In this installment, I will look at Italy, 4-time World Cup champions (1934, 1938, 1982, and most recently in 2006), who have drawn a tough group that includes Uruguay, England, and Costa Rica. Italy play their first match against England on June 14th. There are only two players remaining in the Italian squad from their 2006 World-Cup winning team. One is goalkeeper Gianluigi Buffon, who at 36 years of age is still considered one of the best keepers in the world. The other is central midfielder Andrea Pirlo. Both of these players have been key contributors to the successes of the Italian National team for the past 15 years, but Pirlo in particular is poised to have a big impact on Italy’s chances in this year’s tournament. At 34 years of age, Pirlo is still widely considered one of the world’s best holding midfielders, and his play with both Italy and club team Juventus, who captured their record 30th Italian Serie A championship this year, confirms this claim. Among Pirlo’s talents is one key ability that allows him to give his team an edge in every match: the ability to play a “penetrating” pass that splits two of the opponent’s defenders during open play. Recent research into predictors of success in the World Cup by Saito and Yoshimura (2011) has identified that, of all goals scored during open play, over 50 percent of them occur after a penetrating pass has been played to a forward player. Furthermore, other goals (for example, goals scored from crosses) and also other scoring opportunities (shots on target, or plays that lead to set pieces like free kicks and corner kicks) comprise a passing sequence that contains a penetrating pass over 80 percent of the time. A player like Pirlo, who has the unique ability to see the gaps in opposing defenses and play accurate passes through them to his teammates, is thus an extremely valuable asset, creating several scoring opportunities for his team each game. Add to this the fact that Pirlo is also exceptional at scoring from free kicks (many of which may arise from a forward player receiving a penetrating pass from him and then being fouled by the opponent) and he becomes even more valuable to his team (and even more dangerous to his opponents). The video shown here contains a stunning highlight reel of Pirlo’s greatest plays, including several penetrating passes, as well as goals from free kicks and open play. Can he repeat these types of performances and help the Italians win a 5th World Cup title? We will have to wait and see what happens in 2 months’ time. Great article by Gabriele Marcotti about the transition made by the Brazilian National football (soccer) team from 1982 until today. Because this is a World Cup year, I have decided to countdown to the tournament by providing a short soccer/fitness related preview of each of the 32 participating nations. In this installment, I will look at Japan, perennial Asian contenders, who have drawn a group that includes Cote D’Ivoire, Colombia, and Greece. Japan play their first match against Cote D’Ivoire on June 14th. Keisuke Honda, generally regarded as Japan’s best player, has several unique talents. Among them is the ability to strike a ball that travels at high speeds, but does not spin or rotate at all while traveling through the air. Termed the “knuckle shot”, this type of strike is very deceptive to goalkeepers, because the lack of spin prevents them from making a decision about where to move to save the ball until it is “too late”. Honda has proven himself to be very effective with the knuckle shot during set pieces for the Japanese National team. But don’t just take it from me – watch this video to see Honda’s knuckle shot in action: http://www.youtube.com/watch?v=VlQEjpU6EIE. At the 7th World Congress on Science and Football, held in Nagoya, Japan in May, 2011, the knuckle shot was a very popular topic of discussion, both among the Japanese and other researchers from around the world. One oral presentation at the Congress, done by Hong et.al. through the Department of Comprehensive Human Sciences and the University of Tsukuba, Ibaraki in Japan, was titled “Impact Phase Kinematics of Knuckling Shot in Football”. This study examined the knuckle shot in detail, with particular emphasis placed on the position of the foot/leg, and the impact forces on the ball when it is being struck. Without getting into all the details, the study concluded that an effective knuckle shot has both a reduced “angle of attack” – that is, the foot should strike directly through the ball in a straight motion as opposed to the slightly upwards motion of more “traditional” instep ball striking – and a “translational” ankle movement at impact – that is, the heel is pushed out towards the inside of the foot when the ball is hit. Keisuke Honda has clearly become an expert in the technical application of the above-mentioned impact phase kinematics of the knuckle shot, and the results have been very impressive. He will present a danger to any opponent who gives up a set piece 40-yards or less from goal. Can his knuckle shot be the difference that sees Japan through Group C and into the knockout stage? We will have to wait and see what happens in 2 months’ time. Because this is a World Cup year, I have decided to countdown to the tournament by providing a short soccer/fitness related preview of each of the 32 participating nations. In this installment, I will look at Cote D’Ivoire, one of the strongest teams from the African continent, who have drawn a group that includes Colombia, Greece, and Japan. Cote D’Ivoire play their first match against Japan on June 14th. 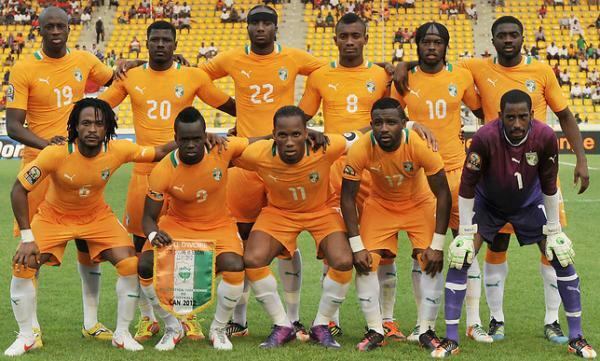 Cote D’ivoire boast a starting-11 that rivals any of the top teams in the world, including strikers Didier Drogba and Solomon Kalou, midfielders Yaya Toure, Didier Zokora, and Gervinho, and defenders Emmanuel Eboue and Kolo Toure. At times, however, a highly talented team of individuals can underperform if they do not play as a cohesive unit on the pitch. In the Ivoirian’s two previous World Cup appearances in Germany 2006 and South Africa 2010, they boasted a similar line-up of world stars (including some players who feature in this year’s squad), yet on both occasions they failed to progress past the group stage. This year, with a slightly less difficult group than they had in either 2006 or 2010, Cote D’Ivoire has a great chance to reach the knockout round of the World Cup for the first time in history. A lot of sports psychology research has been done into team dynamics, and how to get the best out of a group of talented individual athletes that form a team. In general, In general, the responsibility falls on the coach and leader(s) on the team (captains) to get all players to buy into the idea that they will be a stronger team – and get better results – if they work together, rather than if each individual works only for themselves. Getting talented players who often have big egos and a large sense of self worth to behave and play in a less selfish way is challenging, but the rewards can be substantial. For Cote D’Ivoire, the responsibility rests with French coach Sabri Lamouchi, and team captain Didier Drogba. If they can get their team to believe that the whole is greater than the sum of its parts, then we could see the Ivoirians progress at least until the round of 16, if not farther. We will have to wait and see what happens in 2 months’ time. Great article for soccer parents to read. How many of these 4 are you guilty of?